This antique looking double door pie safe will be the perfect choice for some additional storage in the kitchen or dining room. It will bring back memories of Grandma's kitchen pie safe. This Double Door Pie Safe is shown in solid oak wood with our OCS-101 stain and the copper wheat panel doors for a country style look. You can completely change the look and feel of the pie safe by choosing a more contemporary, trendy wood type such as walnut wood, elm wood, maple wood or cherry wood. 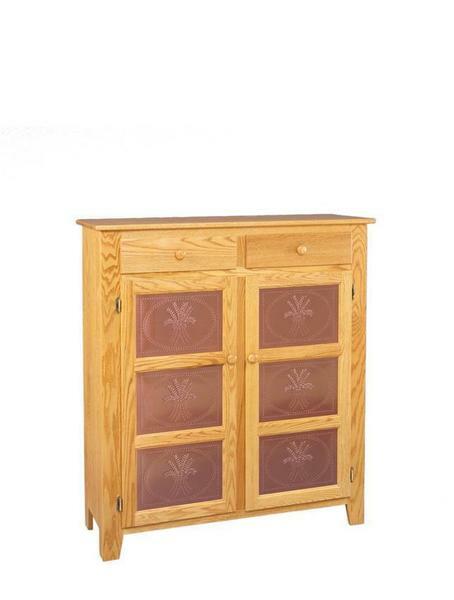 Call one of our Amish furniture specialists today to receive wood and finish samples for this pie safe. You also can choose to order wood doors instead of the copper doors with the wheat design. Visit our Amish furniture store in Sarasota, Florida to see our furniture in person or give us a call so we can chat at 1-866-272-6773.